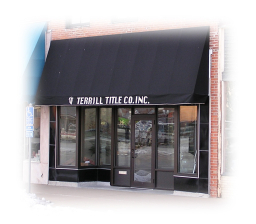 Terrill Title Co., Inc. specializes in Title Insurance and Real Estate Closings. We provide services for the counties of McDonough, Hancock, Fulton, Schuyler, Mason, Brown, Pike, Calhoun, and surrounding counties in Illinois. Our goal at Terrill Title Co., Inc. has always been and will continue to be serving our customers with respect and giving them a timely and accurate product.